In todays Facebook, Instagram, Google and related social media and search engine age, one is likely to be unaware of big role algorithms play in determining the content you see and do not see while scrolling through your newsfeed or search engine results. As provided by renowned Constitutional Rights Professor Pierre De Vos “…Algorithms used by large companies like Google and Facebook play a pivotal role in curating information on the internet. This raises serious questions about the impact of such algorithms on the rights of individuals to receive and impart information.” This is of concern taking in to consideration that our right to Freedom of Expression, which includes the freedom to receive or impart information or ideas, as guaranteed by section 16 of the Constitution, can easily be infringed by the use of algorithms. Professor Pierre De Vos highlights that the algorithms are programmed and coded in such a way as to create what is called “Filter bubbles”. “Filter Bubbles” serve as the personalisation of information based on preferences captured and recorded by the algorithms of the internet sites visited and may be biased towards certain types of content or content providers, thereby effectively and unjustifiably infringing upon the right to freedom of expression as they control and limit the content that is viewable. It serves as an unnerving reminder of South Africa’s media and content censorship under the Apartheid Era. Professor Pierre De Vos provides that although our traditional conceptions of the Right to Freedom of Expression do not adequately address the potential threats posed by algorithms, the Constitution itself contains a number of powerful provisions that will allow us to rethink and reconsider the horizons and limits of the right to Freedom of Expression. Reformulating and reconsidering the right to freedom of expression needs to be done in a cautionary manner to avoid any form of interference that may serve to restrict rather than advance the right to freedom of expression. 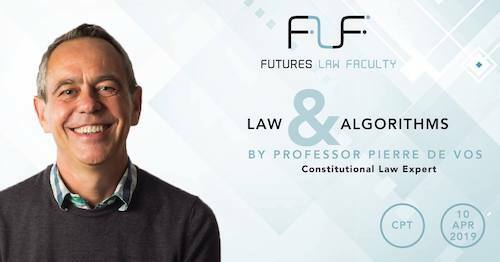 Join Professor Pierre De Vos and the Futures Law Faculty in unpacking and elaborating on the Freedom of Expression in the digital age of algorithms on 10 April 2019 from 16:00 at Radisson Red (V&A Waterfront). Book your tickets now through Quicket or www.Futureslawfaculty.co.za. Tickets selling out fast! Please advise if it is possible to attend this via a webinar platform. Kristi here from the Futures Law Faculty. We do offer an on-line viewing of the Masterclass. The Masterclass is recorded and then loaded to our platform a few days after the Masterclass. If you are interested in the on-line viewing option please feel free to send me an email – info@futureslawfaculty.co.za and I will send through all the necessary information in regard to costs, login details and timelines.